Arkay's Standard Stainless Steel Sinks are also constructed of 18 gauge Type 316 LC (low carbon) stainless steel. They are heliarc welded into one solid piece, then ground, polished and passivated to provide the ideal surface for photo chemicals. They are lifetime undercoated for sound insulation and condensation prevention. 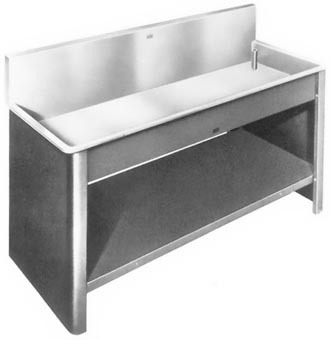 Standard Stainless Steel Sinks are available in 6" or 10" depth in a full range of sizes from 18"x36" to 48"x120". Custom sinks can be designed for unique or special applications. A variety of options and accessories are available to maximize the convenience and utility of Arkay sinks.